Uh... I am still working on this page. Most sites have a frequently asked questions section so I created one here. Nothing frequently asked yet so not much here. If you really need to know something go to the Sandiego Manor. It has the answers. When can I see "Where on Earth is Carmen Sandiego"? Carmen has returned to U.S. airwaves! PAX TV shows "Where on Earth is Carmen Sandiego?" They air Carmen episodes Saturdays at 8am EST. In Hawaii you can watch it at 7am on Oceanic Cable Channel 27. 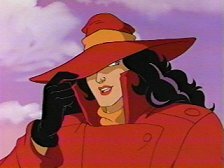 Fox Family Channel used to air "Where on Earth is Carmen Sandiego?" Sunday mornings. 4 a.m. in Hawaii (on Oceanic Cable Channel 30), 7 a.m. on the mainland. It has not been on since 9/26 and I do not know when or if it will return. Check your local listings to find out when and where you can catch Carmen Sandiego. You might want to visit tvquest.com or tvguide.com to look for info online. At the PAX TV website you can enter your zip code and find the nearest Pax station. 10-04-99 "The Good Old, Bad Old Days"
10-05-99 "Rules of the Game"
10-07-99 "Music to My Ears"
10-08-99 "The Play's the Thing"
10-14-99 "Boyhood's End Part 1"
10-15-99 "Boyhood's End Part 2"
10-21-99 "Birds of a Feather"
11-02-99 "The Good Old, Bad Old Days"
11-03-99 "Rules of the Game"
11-05-99 "Music to my Ears"
11-09-99 "The Play's the Thing"
11-17-99 "Boyhood's End Part 1"
11-18-99 "Boyhood's End Part 2"
11-23-99 "Birds of a Feather"
12-03-99 "The Good Old, Bad Old Days"
12-06-99 "Rules of the Game"
12-08-99 "Music to My Ears"
12-10-99 "The Play's the Thing"
12-20-99 "Boyhood's End Part 1"
12-21-99 "Boyhood's End Part 2"
12-24-99 "Birds of a Feather"
01-08-00 "The Good Old, Bad Old Days"
01-15-00 "Rules of the Game"
01-29-00 "Music to My Ears"
02-05-00 "The Play's the Thing"
03-11-00 "Boyhood's End Part 1"
03-18-00 "Boyhood's End Part 2"
Here's a list of what they have shown and when it was on. The cartoon used to air Sundays at 7am on the Fox Family Channel but it has not been on since 9/26 and I do not know when or if it will return. [R] = they have shown the episode at least once before. none = Carmen was preempted. 09-05-98 "The Good Old, Bad Old Days"
09-19-98 2007-A "Boyhood's End Part 1"
09-26-98 2008-B "Boyhood's End Part 2"
11-07-98 1012-A "A Date With Carmen Part 1"
11-14-98 1013-B "A Date With Carmen Part 2"
12-12-98 "The Trial of Carmen Sandiego"
12-19-98 3010 "Just Like Old Times"
12-26-98 4008-A "Can You Ever Go Home Again? Part 1"
01-02-99 4009-B "Can You Ever Go Home Again? Part 2"
01-09-99 [R] "Skull and Double-Crossbones"
01-16-99 [R] "Timing is Everything"
01-30-99 [R] "By A Whisker"
02-06-99 3001 [R] "The Tigress"
02-20-99 3003-A "Labyrinth Part 1"
02-27-99 3004-B "Labyrinth Part 2: Woman of the Year 2101"
03-06-99 3005-C "Labyrinth Part 3: When in Rome"
03-14-99 [R] "By A Whisker"
04-18-99 1012-A [R] "A Date With Carmen Part 1"
04-25-99 1013-B [R] "A Date With Carmen Part 2"
05-02-99 [R] "Skull and Double-Crossbones"
05-09-99 2002 [R] "Hot Ice"
05-16-99 2007-A [R] "Boyhood's End Part 1"
05-23-99 2008-B [R] "Boyhood's End Part 2"
05-30-99 3001 [R] "The Tigress"
06-06-99 3003-A [R] "Labyrinth Part 1"
06-13-99 3004-B [R] "Labyrinth Part 2: Woman of the Year...2101"
06-14-99 2007-A [R] "Boyhood's End Part 1"
06-14-99 2008-B [R] "Boyhood's End Part 2"
06-20-99 3005-C [R] "Labyrinth Part 3: When in Rome"
06-27-99 3007 [R] "Shaman Spirits"
07-11-99 3010 [R] "Just Like Old Times"
07-18-99 4001-A "Retribution Part 1: Unsinkable Carmen Sandiego"
07-25-99 4002-B "Retribution Part 2: In Memoriam"
08-01-99 4003-C "Retribution Part 3: Maelstrom's Revenge"
08-08-99 [R] "The Trial of Carmen Sandiego"
08-15-99 4008-A [R] "Can You Ever Go Home Again? 1"
08-22-99 4009-B [R] "Can You Ever Go Home Again? 2"
08-29-99 [R] "The Good Old, Bad Old Days"
09-12-99 2002 [R] "Hot Ice"
09-19-99 3007 [R] "Shaman Spirits"
09-26-99 4001-A [R] "Retribution Part 1: Unsinkable Carmen Sandiego"
Which episodes does Fox Family Channel love to air? The Avalon Mansion has a list of which episodes aired how many times... for those of you who don't want to look at the list above and count it (me! me! me!). Here's the episodes I need. I have 39... 1 more to go!